This is the nearly final version of the vehicle with no zimmerit, lat production features like the close-defense weapon and remote control machine gun mount, and the the iconic “Saukopf” (boar’s head) mantlet. There are 32 different parts in this kit as opposed to the July 1944 kit with zimmerit (6633 on the above list). What comes in the box provides a near final production version with “Saukopf” mantelet while retaining all of the features which were popular with the earlier kits. As it uses the “Smart Kit” it retains individual torsion bars and road wheel arms as well as all of the external details on the lower hull such as shocks and bump stops. Each idler wheel consists of five parts with twin brass inserts between the plastic castings. All wheels are detailed to the point of having the rubber tire manufacturer’s data readable! Brass is provided only for those bits where plastic cannot do the job, such as the aforementioned wheel rims and the air intake and exhaust grilles on the engine deck plus some non-slip gridding. All fender details are separate and go on in subassemblies. 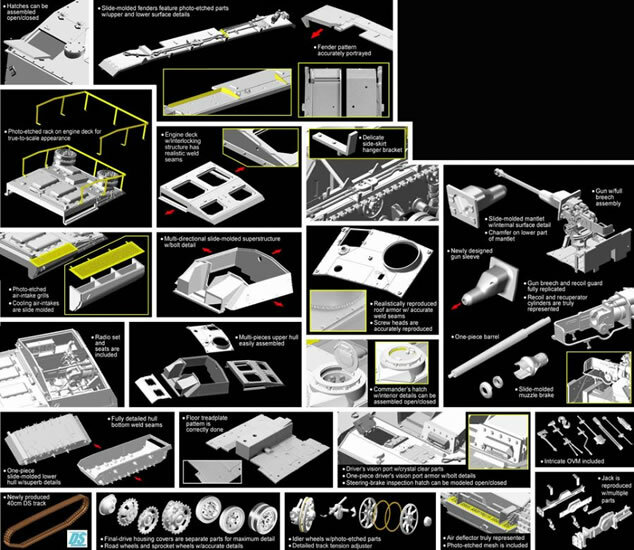 In point of fact, most of this model consists of subassemblies, which is how it gets its tremendous level of details. The kit retains a high level of interior parts, including the gun, commander’s cupola assembly, floor, and the radios and stowage racks for various bits on each side of the casemate. Likewise the engine deck consists of several subassemblies combined to form the deck. Note that every hatch on this vehicle can be opened for display of the interior, but there is no engine or transmission provided. This kit also now comes with the remote control mount for the machine gun and its reduced size gun shield. Final assembly again has a number of different modules combined into one final assembly – lower hull, fenders, engine deck, interior, gun barrel, casemate, and tracks. Oddly enough, while the radios and antenna bases are supplied, no comment is made about the antennas for them! The kit provides a full set of schurtzen racks but no plates for the side armor. It also retains the “luggage rack” at the rear of the hull as provided by a etched brass frame. This kit comes with 40 cm tracks in DS Plastic but as DML does not note the proper length for them before installation as they do with their 1/72 “Armor Pro” series kits I have no way of telling if they will sag or be too taut. As the tracks in those kits vary by 3-5 mm in length either way, hopefully someone who has used them can give a good number for the proper length of the unfitted tracks. Technical support was provided by Tom Cockle and Gary Edmundson. Three different finishing options and a targeted Cartograf decal set are provided: Unidentified Unit, East Prussia 1945(sand with whitewash, no markings); 185th StuG Brigade, East Prussia 1945 (sand overall, black L 0); 185th StuG Brigade, Eastern Front 1945 (tricolor upper hull, sand lower, black crosses). 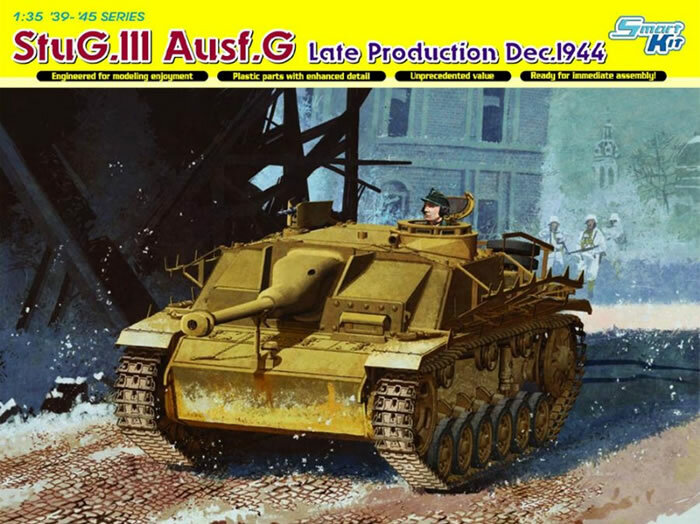 Overall, this should be the most popular version of this kit as it is the iconic Sturmgeschuetz and the inclusion of the single piece tracks will please many modelers who do not like single link tracks.